Relative adjectives are rare in both French and English, as they are found primarily in legal, administrative, and other very formal language. 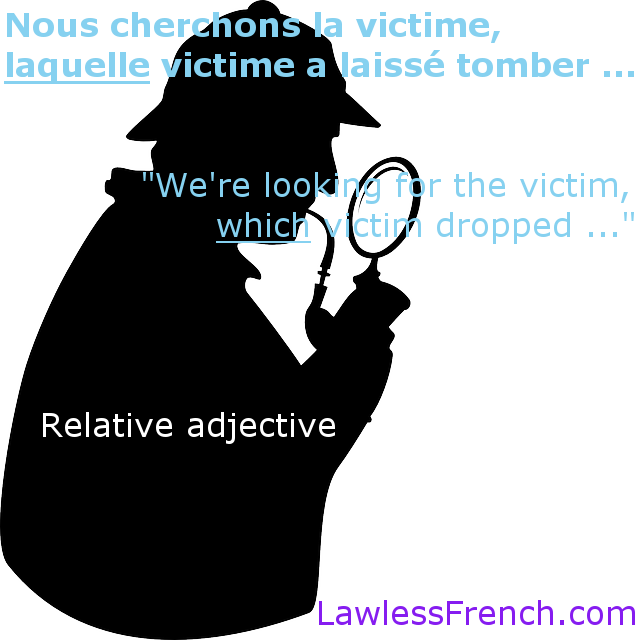 The French relative adjectuve lequel (and its various forms) creates a link between a preceding antecedent and a following noun. Le défendeur possède un pistolet, lequel pistolet il a obtenu illégalement. The defendant owns a pistol, which pistol he obtained illegally. Nous cherchons la victime, laquelle victime a laissé tomber son portefeuille. We’re looking for the victim, which victim dropped his wallet. Like any other adjective/pronoun pair, the difference is that the adjective is used with a noun, while the pronoun replaces one. Adjective Le défendeur possède un pistolet, lequel pistolet …. The defendant owns a pistol, which pistol …. Pronoun Nous avons trouvé un pistolet. Lequel ? We found a pistol. Which one? Why not: “on cherche la victime, qui . . . ” ?